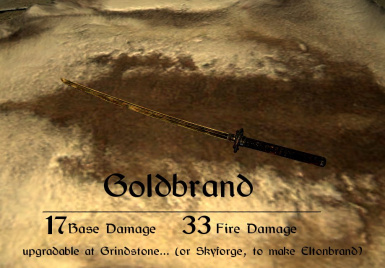 This mod adds a quest to obtain the Legendary sword Goldbrand, that has been in Morrowind, and Oblivion. to get Goldbrand can be tricky, as I made a trail of books that leads to a cryptic treasure map. BUT, I also included a version of the mod with a complete walkthrough, and you could just flip to the end of the book and go get the sword if you really wanted to... or play through the riddle-like book trail quest. 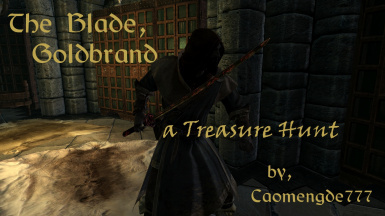 to get the first clue, the Book "The Blade, Goldbrand" can be found in the mages college Arcanaeum, the library. 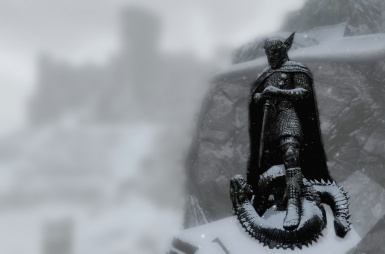 If you could donate, it would be great, I spent many hours before the creation kit was released to create this mod, my paypal email is [email protected], thank you. if you load "cao_goldbrand_WT.esp" there is also a "Goldbrand Walkthrough" .. both books are ontop each other. * Goldbrand has 17 base damage and 33 points of fire damage. 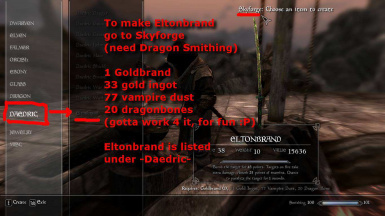 * Eltonbrand has 18 base damage, 35 fire damage, 20 absorb stamina, chance to paralyze for 1 sec. (Daedric sword has 14, Daedric 2Hand sword has 24) Goldbrand was one of the best best swords in the other 2 older games.